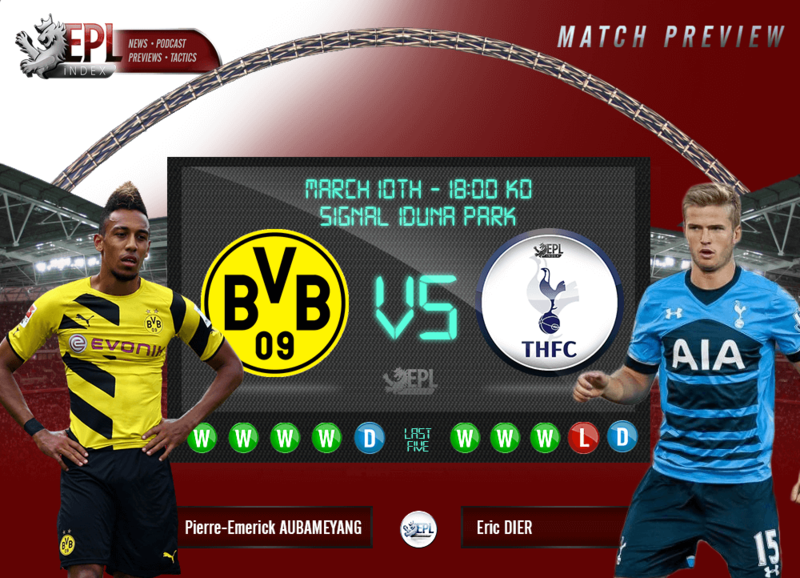 On March 10th, German powerhouse Borussia Dortmund will welcome Tottenham to Signal Iduna Park for arguably the most high profile round of 16 tie in the Europa League. The two sides are both currently second in their domestic leagues, with both Spurs and Dortmund trailing the league leaders, Leicester City and Bayern Munich respectively, by five points. With that in mind, both teams will have one eye on the league during this tie, which could make team selections very difficult for managers Maurico Pochettino and Thomas Tuchel. Both teams know how good the other is and know they’ll need to take this tie seriously if they want to advance. Dortmund are without only one major player as Sokratis Papastathopoulos is set to miss out with a groin injury. Spurs will be without the suspended Dele Alli. On top of that they’ll be without Clinton N’Jie, who is not yet ready to return to match action despite returning to training, and Jan Vertonghan. The two sides have never played in a competitive match before. Dortmund are undefeated at home in the league this season with 10 wins and two draws. In those 12 home league games, the German side have scored 34 (2.8 goals a game) and conceded only nine (0.75 goals a game). Dortmund are tied with Bayern Munich for the most goals scored in the Bundesliga (59 total or 2.36 per game), while Spurs have conceded the fewest goals in the Premier League (24 or 0.83 per game). Dortmund are full of top quality players, like Marco Reus, Ilkay Gundogan, Julian Weigal, and Mats Hummels to name a few, but their star this season has been their 26 year old striker Pierre Emerick Aubameyang. The Gabon international has been scoring week in week out for Dortmund this season and his goals are a huge reason Dortmund are where they are in the league. After two good seasons under Jugen Klopp, Aubameyang has made the leap from good to very good under Thomas Tuchel. He has been finishing his chances at about the rate you’d expect most strikers to score at, but he has been getting into goalscoring positions relentlessly. His goals combined with the strength of Dortmund’s midfield give them the chance of winning both the Bundesliga and the Europa League. One of the big changes in Tottenham’s team this year has been their change in midfield. At the center of that has been Eric Dier in defensive midfield. Last season, Spurs routinely had their press broken through their midfield of Ryan Mason and Nabil Bentaleb. This season they have paired Dier with a multitude of players such as Mason, Dele Alli, and Dembele and they have been much less susceptible to quick counterattacks through midfield. Dortmund have one of the strongest midfields in world football, so the young Englishman will have to be in his game if Spurs are to have a chance. In the end, this first leg should be Dortmund’s to lose. While they haven’t always been focused in the Europa League this season, they have the quality to take down most teams in world football and, while Spurs are very good, the Germans should be able to edge the home leg. Categories: EPL Index Featured Article, EPL Index Match Previews, Tottenham Hotspur, and Tottenham Hotspur (NN).' 'Tags: EPL, EPL Index Match Previews, EPLIndex Match Preview, Eric Dier, Europa League, Europa League match preview, Ilkay Gundogan, Julian Weigal, Kane, Marco Reus, Pierre-Emerick-Aubameyang, THFC, Tottenham, and Tuchel.